Just take a look around this blog and you will find a little bit of work I have done on Excel slicers: introduced in Excel 2010. 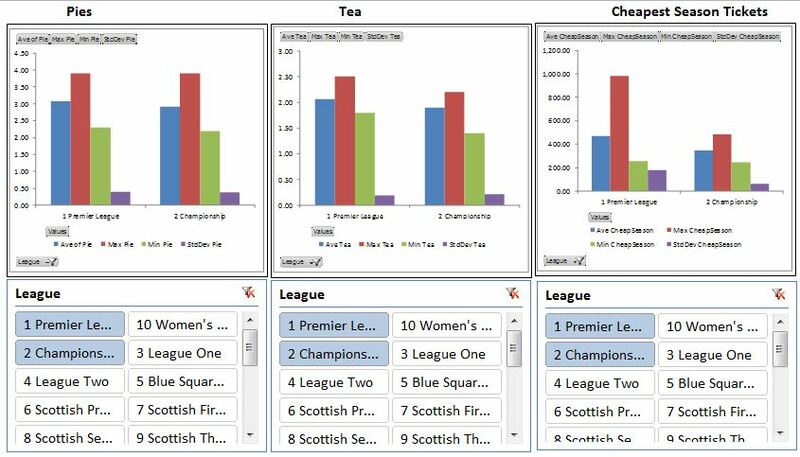 Two days ago I came across some fascinating information on the cost of supporting teams in the English and Scottish Football Leagues and a women’s league that I have used to prepare a series of Pivot Tables and Slicers. I also decided to prepare a basic dashboard for this information by using the Camera Tool rather than just leaving the Pivot Charts in their native format. 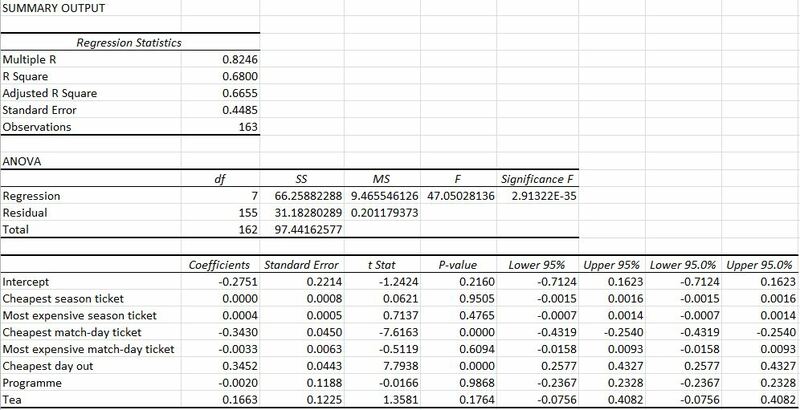 I used an Excel Table to organise the data, by the way and rearranged the data a little bit to optimise the look of the worksheet and to make it a little bit easier to work with. I cannot make the spreadsheet available because it contains information that is not mine. You can find the information for yourself here, though. Clearly, this is just one aspect of the entire database: just three of the eight data series available. Never mind, download and work with the data and see the rest for yourself. there’s even a reasonably high level of correlation between the price of a tea and the price of a pie! The conclusion from this regression analysis is that this overarching model is too much and it needs to be redesigned … go to! See if you can find a model that helps football fans to predict the price of a pie! Well, there you are, some insights into the data relating to the cost of supporting a football team in England and Scotland, including a women’s league!